We live in a day and age where thieves are not afraid anymore to attack properties and steal valuable things. They have become increasingly better at what they do, so they use advanced tools to disable security alarms and unlock latches. People from all over the world are increasingly worried about the growing threat of home burglary. The best way to stay protected against thieves and to keep your valuable objects safe is to outsmart them. If thieves manage to enter your home, which is not that unlikely, they will look in drawers for valuable objects. They will never look in the fridge. That's why storing your valuable items in a Rock Start energy drink can is the ultimate protection idea. Thieves know people are always working late, so having a couple of energy drinks in your fridge is something natural. A thief would pay no attention to it unless he is really thirsty. For that, you can add some real energy drinks in your fridge and put them in the front, while the safe cup sits in the back of the fridge. 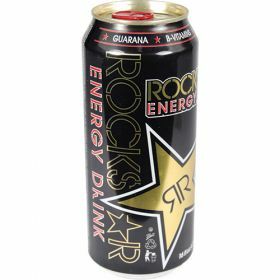 Our energy drink can act as the perfect safe, enabling you to stash away money, jewels or any other valuable assets. You can store your valuable items safely and securely in the fridge, knowing that there is no way potential thieves will get to them. 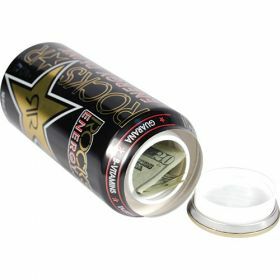 Order our energy drink hidden safe now and get the peace of mind your valuable items are safe and protected from modern thieves.